You are the proud parent of a teen who has just completed a driver’s education course and acquired their very first driver’s license. Congratulations. And while you are very excited for your son or daughter, you are petrified with fear as well. This is because you know the statistics and have read all about the horror stories concerning teen drivers. The early years of driving are the most dangerous as new drivers are more likely to have an accident. Even more concerning is that this isn’t like when they were learning to walk and would fall down or when they were learning how to ride a bike and scrape their knee, the consequence of a car accident can be deadly. 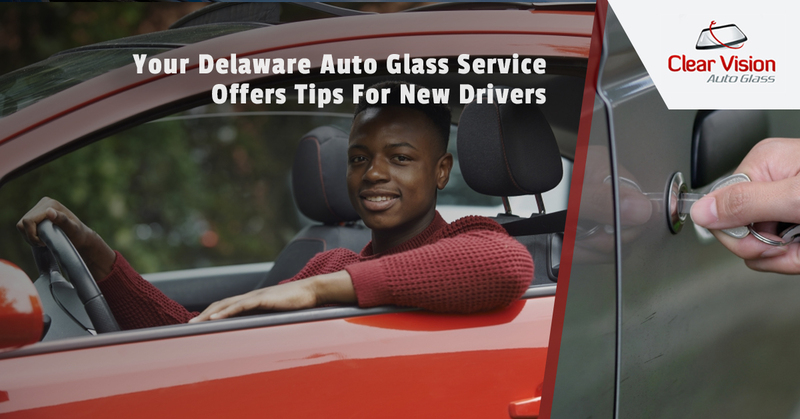 Clear Vision Auto Glass, your auto glass shop serving New York and Delaware, knows that when it comes to cars, safety is an important issue. Here are a few safety tips for the new driver in your household. Teens tend to get too caught up in what others think about them, this can be dangerous when it comes to driving habits. There is nothing wrong with driving safely or within the posted speed limits, no matter what other people are doing. Even if you are “that” car that drives the speed limit and others are always passing, you are still doing the right thing. So if some jerk is behind you flashing their lights on honking their horn because they want you to go faster, don’t worry about it. There is no escaping Karma and they will get what is coming to them. It’s natural to be nervous when you first learn how to drive a car, but like learning how to ride a bike, it will get easier. It’s OK to be nervous because driving is a dangerous activity. In time, you will get more and more confident in your abilities. But don’t become too confident and think you can drive like Jeff Gordon or Danica Patrick, because you can’t. All vehicles are different and you need to be familiar with all of the controls before firing up the engine and driving down the road. You need to know where the seat adjustment controls are, the headlight switch, the window controls, the heater controls and anything else you might have to find while you are driving. Things start to change when you and your friends start getting a driver’s license. This newfound freedom prompts some people to follow different paths. You don’t want to be hanging around people who cannot follow the laws of the road, who drink and drive and who are always using their smartphones when they are on the road. You are better than that. You hang out with friends who drive the speed limit, avoid drugs and alcohol and drive with their cell phones turned off. Just like you. If you have a cracked windshield, contact Clear Vision Auto Glass for a quote.